“The game was a better fight than expected,” said Erik Andre of Lakelands’ 28-6 victory over George Jenkins. Lakeland was the first on the board with 4:56 remaining in the first quarter when GJ’s quarterback fumbled the ball out of the endzone to give Lakeland the lead 2-0 on a safety. The score remained the same until 8:49 in the second quarter when Ricquan Southward went for a 65-yard touchdown run off of a punt to bump the ‘Naughts up to 9-0. Jenkins retaliated with 21.7 seconds remaining on the clock with a defensive touchdown off of a Lakeland fumble, bringing the score to 9-6 at the half. The first half saw no offensive touchdowns from either team. The game was tight until the fourth quarter when Raheeme Dumas ran the ball 38-yards on a quarterback keeper with 8:04 on the clock. Lakeland would score again on a 7-play possession that would end with a touchdown from the 2-yard line on a quarterback keeper by Dumas. Southwards attempt for a two-point conversion would be denied, making the score 21-6. The ‘Naughts gained momentum, scoring with 2:23 remaining in the game on a 28-yard pass connected to Southward, making the final score 28-6. Kicker Caleb Hough went 2-3 for the night. Ian Bacon had 3 catches for 61-yards, Dumas was the leading rusher for 11 carries for 75-yards. Lakeland would end the night with 264 total yards and 11 first downs. GJ had 42 total yards and 9 first downs. “It was a good win. We’re 8-0, we have an opening this week and we just want everybody well,” said Coach Bill Castle. 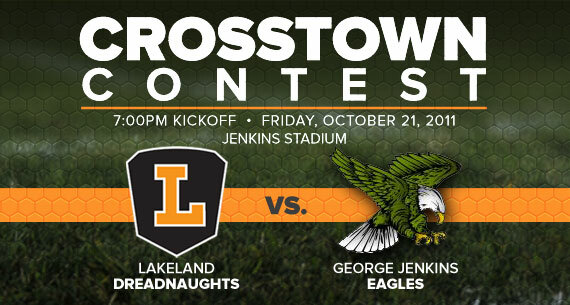 Lakeland is down several players due to injury, but have the bye week to rebuild. The next game is against Ridge Community at home for the district title on November 4. In this edition of Conversations with Coach Castle, you’ll hear from the Dreadnaught head coach and Defensive Coordinator Jason Butler. Coach Castle shares thoughts on the victory against Miami-Hialeah and about this Friday night’s away game against George Jenkins. Coach Butler talks about what it means to him to be a coach. Conversations with Coach Bill Castle is shot and edited by Barrett Creative, a Lakeland, Florida based video production, web design and graphic design company.